There's a message that's making the rounds on WhatsApp that mysteriously causes the app to crash if you dare to tap on the black dot within. You may have already come across it and wondered how just tapping on a single emoji can cause an app to freeze and become unresponsive. The answer, unsurprisingly, is that it can't. 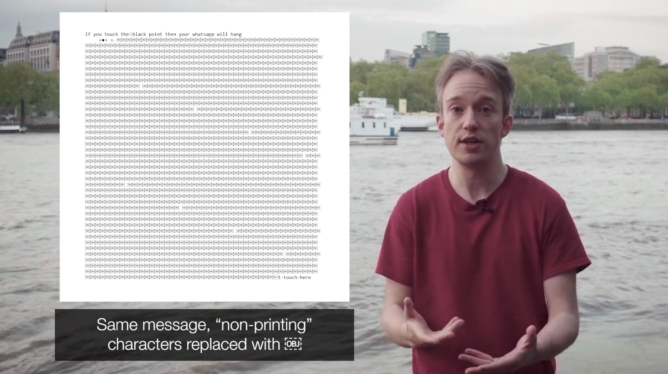 Tom Scott, a relatively popular YouTuber who covers multiple topics ranging from science to computers, posted a brief explanation of how the message bug works. The gist of it is that the invisible part of the message is comprised of special characters which Unicode uses to specify whether a given text should be laid out right-to-left or left-to-right. These characters are necessary to properly display text in several languages that are written right-to-left, such as Hebrew and Arabic. There's nothing wrong with these characters per se. Modern devices have been able to handle LTR and RTL text for decades, even within the same sentence. The issue only shows up when a strange combination of characters triggers some obscure bug in the rendering engine — which is precisely what is happening here. The sequence of two thousand characters switches the text's orientation back and forth repeatedly, and when the engine can't handle this string of characters, it locks up and crashes the app. The curious part is that Android is able to display the characters without any issue, but locks up when a user tries to tap the message. 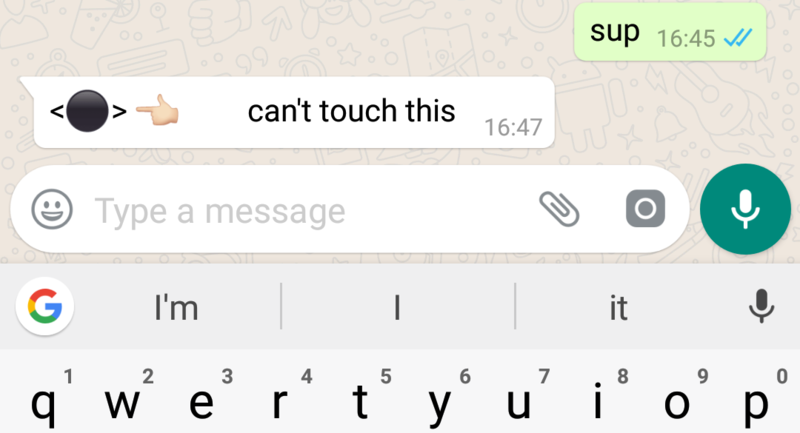 As you may have guessed, there's nothing particularly special about WhatsApp: the bug is related to Android's text rendering engine, so almost any app that displays text is susceptible to it (Chrome seems to be immune to the bug, however). Fortunately, the bug is also mostly harmless. It won't cause any data loss, it won't force your device to reboot, and it won't prevent you from closing the app and opening it again. As far as text rendering bugs go, that's pretty tame, and the same can't be said for other bugs that have come up over the years. This isn't the first bug of its kind we've come across, and it certainly won't be the last. It's also clear that there's nothing at all special about the black dot emoji, since it's not the emoji itself that's causing the crash. Any other emoji works just as well, though a black dot has an arguably more ominous vibe to it. If you'd like something slightly more cheerful, here are a few variations. Google will likely release a fix to address the issue soon. In the meantime, you should avoid tapping on suspicious messages from "friends" if you don't want your apps to crash.